Report From The Battle Of Ideas: "Can we trust the evidence? The IPCC – A case study"
Of course Obama wants no solar panels for the White House, and Revkin gives up on the climate fight. Keith Kloor finds out some people want to censor what they don’t perfectly like. If another bunch of hidden, dodgy emails shows up now, the “catastrophic climate” discourse will go the way of the Dodo. Has The UK Establishment Got Any Confidence In Climate Science? Among the few things I have learned after thirteen years of living in England, there’s an appreciation for understatements and reading between the lines. Prurient, tight-lipped local society is in fact constantly trying to verbally channel its anger and other frustrations in “acceptable” ways, so the language is hammered day-in day-out by the search of new ways to speak the unspeakable (eg the number of objects whose names can’t be used for sexual innuendos is dwindling if not already zero). That’s why I am developing a feeling that the botched, inconclusive, confused Climategate inquiries have actually been yelling their underlying message loud and clear. Pearce was passionate in arguing that ‘Climategate’ was a very human tragedy, in respect of scientists feeling under siege and becoming fiercely defensive – which only spurred on the sceptics, who thought there must be something to hide. But he thought many CRU critics were not sceptics at all: “They are actually data libertarians, rather than climate sceptics, still less climate deniers. 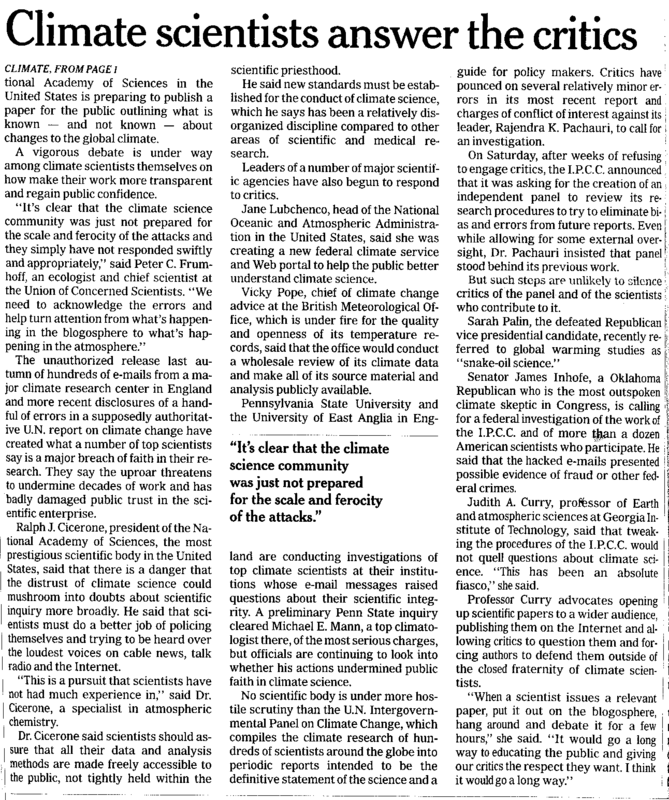 It turned into data wars.” Pearce’s conclusion was that at this turning point for climate science, more “candour” was needed from all. Count me in as Data Libertarian! Bob Watson opening remark was that he hadn’t read the e-mails in question. This was a bad mistake – many in the audience were very familiar with them, and not happy to be lectured by somebody who wasn’t. IPCC was imperfect but the best that could be devised 95% of scientists agree…it is now just a risk management exercise. Errors corrected quickly…As good as having Ravendra, but no need for the extra slot at Heathrow for him to land his jet. Very much the Scientific Establishment figure. Keenan was interested in research fraud and the lack of accountability in science as a whole. He accused Jones of committing fraud, even after being given a chance to withdraw the remark. Davies tried to defend Jones but had no details. Keenan showed a more street-savvy business approach than any of the other participants. I’d like to have heard him at greater length. Overall conclusion: there was no conclusion. Everybody agreed that openness and transparency were good, that debate should be with all parties and that uncertainties should be made more clear. But my own view is that the proof of the pudding is in the eating. This one still has legs and will run and run. Worried about some dodgy behavioural traits of some prominent British scientists? Astonished at the cavalier attitude regarding publications and dates by IPCC Lead Authors? [John Maynard Smith, the famous British evolutionary biologist] coined the term “kin selection” in an article that ran off with Hamilton’s idea without giving him much credit. In the meantime, Maynard Smith was one of the anonymous reviewers on Hamilton’s seminal 1964 paper elaborating on the idea, which was delayed for nine months while Hamilton made the requested changes, thus allowing Maynard Smith’s article to appear first — something Hamilton harbored a grudge about his whole life. Therefore (according to Sir Muir Russell), nothing in the above does “threaten the integrity of peer review or publication” (p.68, chapter 8.6 item 18). How nice. UPDATE: Phil Jones reinstated at UEA within minutes of the Russell report being published. Final proof the Professors behave as absolute fools in matters of Public Relations. And so when the Sir Muir Russell’s Climategate report came out, confusion reigned. Richard Black is now claiming “skeptical circles” had issues with the Oxburgh Science-but-not-science report (what are you implying, Richard, has your BBC colleague Roger Harrabin entered any “skeptical circle” of late?). And Sir Muir (according to what is reported by Black) appears to have spent untold amounts of public money only to miss at least two of the “five key leaked emails” identified (at no cost to the taxpayer) by Fred Pearce. There we are then: three Climategate Commissions, and the only thing that is clear is how important FOI is. 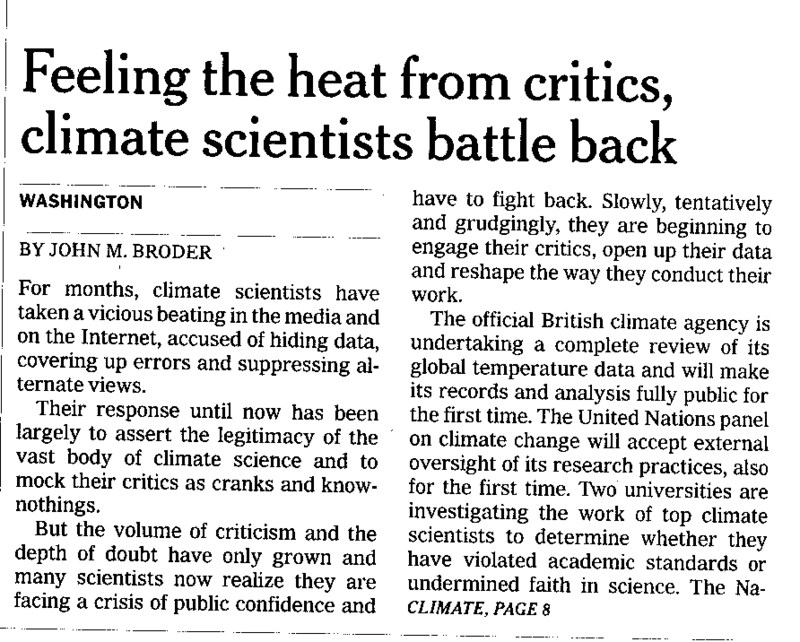 If this is the way climate-related stuff is publicly handled, Lovelock might have been right, after all. ps in the meanwhile…can I have my UK tax money back please? I’d bet both of my hands on the results of Sir Muir Russell’s enquiry on Climategate already being common knowledge among British hacks (otherwise some strange noises wouldn’t be easy to explain). Hence a certain feeling that something rather big will be mentioned during the July 7, 1pm press conference. How big? Certainly not big enough to shatter the Scientific Establishment, in this country or anywhere else. Why, Lord Widgery didn’t mind to go down in history associated with a now-discredited April 1972 “Report” on “Bloody Sunday”, less than 3 months after 14 people died. It took 26 years for Tony Blair to criticize “the rushed process in which Widgery failed to take evidence from those wounded and did not personally read eye-witness accounts“, and then 12 more years for the Saville Report to supersede the old one. That’s 38 years vs. 3 months. Therefore, why should there be any surprise in Lord Oxburgh’s undermining the credibility of his own rushed-up work on Climategate, given also the fact nobody has been killed about it?